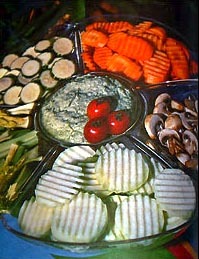 Dips have been popular for as long as I can remember, and vegetable trays are really popular for parties. In the 1960's they came out with a kitchen slicer that makes the crinkles in the vegetables. I can remember, we all had to have one. But mainly people are looking for a dip to put their chips in, particularly for tortilla chips. My favorite dip is the Guacamole dip below. I've had this recipe for years. Slice an avocado in half, take out the seed. Use a knife to make slices in each half. Scoop out with a spoon. Mash with a fork. Add a little mayonnaise or sour cream, 2 Tablespoons Salsa, and 1/4 chopped onion (optional) and half of a chopped tomato. Eat with Homemade Tortilla Chips below. Use scissors to cut tortillas into triangles. Heat a skillet on medium high heat, add a little oil and place the triangles in a single layer in the skillet on med high heat. Sprinkle with salt. Turn each with a fork or tongs. Lightly brown the other side, add more oil if necessary. Drain on paper towels in a bowl, cover. If they brown too fast, turn the heat down. Mix avocado with cream cheese and season to taste. Cover and refrigerate until serving time. Chill and serve with Nacho chips. Layer on a pizza pan in the following order: refried beans, sour cream mix, tomatoes, onions, olives, and cheese. Chill and serve with Nacho chips. Good on Melba toast too. Serve with crisp carrot and celery sticks, or crackers. Cream butter or margarine until soft in a small bowl; beat in tuna, lemon juice, and mayonnaise or salad dressing; fold in olives. Chill. Spoon into small dip bowls. Serve with crisp carrot and celery sticks or crackers. Chill. Serve with raw vegetables. Combine all ingredients, chill. 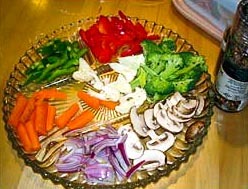 Serve with raw vegetables. Serve with potato chips. Makes 2 cups. Blend 1 1/2 cups dairy sour cream and 2 tablespoons packaged onion soup mix. Stir in 2 ounces crumbled Blue Cheese if desired, and 1/3 cup chopped walnuts. Serve with potato chips. Makes 2 cups. Cream mayo, cream cheese, garlic salt, horseradish, sugar and catsup. Stir in diced onions. Serve with crisp crackers. Makes 2 cups. Whirl all ingredients in an electric blender until smooth. (If you do not have a blender, press beans through a sieve; grate the onion instead of quartering, then mix all ingredients together). Serve with crisp crackers. Makes 2 cups. Put all ingredients in the container. Cover. Press button 7 for 20 seconds or until smooth. Chill one hour. Note: This is a favorite for chips and crackers, but also don't forget to try it on fresh or cooked vegetables, baked potatoes, sliced roast beef, or on barbecued broiled steak. Put all ingredients into the blender container. Cover. Press button 8 for 15 seconds. Use flash blend if needed. Chill two hours. Note: This is superb with chips or crackers. Flavor is enhanced when chilled for at least 2 hours, but best when chilled overnight. Also try topping it with bacon bits or chopped celery. Put all ingredients into the blender container. Cover. Press button 8 for 10 seconds. Use flash blend for a creamier dip. Stop to stir down with a spatula if needed. Note: This dip can be used to stuff celery stalks or as a gourmet treat, mushroom caps. Spoon it into avocado halves for a memorable salad. Makes 1 1/4 cups. Serve with dip size corn chips. Saute onion in butter. Cook broccoli. Put broccoli, onion, soup, cheese and mushrooms in large pan and heat until bubbly. Serve with dip size corn chips. Serve with crackers or chips. Makes about 2 1/2 cups. With electric mixer or rotary beater, gradually blend soup, chili sauce and onion into cream cheese. Chill. Serve with crackers or chips. Makes about 2 1/2 cups. Bake at 350 for 25-35 min. Preheat oven to 350°. Spread cream cheese in 10 inch deep dish pie plate or shallow 1 1/2 quart baking dish (greased). Mix chili and salsa and pour over cream cheese. Sprinkle with Monterey Jack cheese and Colby cheese. May be wrapped and refrigerated if making ahead (may be made up to 2 days ahead). Bake at 350 for 25-35 minutes until bubbly and cheese is melted. Serve hot or at room temperature. Makes 12 servings. Serve with chips. Serves many. Brown sausage and hamburger until crumbled; drain excess grease. In crockpot, melt cheeses. Add meat, soup, tomatoes, green chilies and onions; mix well. Makes a large amount and can be frozen. Serve with chips. Serves many. Brown hamburger and onion; add taco seasoning as directions indicate. In a crockpot empty contents of cheddar soup and taco sauce; add meat, stir. Simmer in crockpot at 150 until cheese soup melts, stirring occasionally and dip away!